1) The cover, look at that cover will you.. if that isn't enough to grab ones attention I don't know what is. 2) A debut for Stephanie Thornton, I LOVE debuts, I don't think that's a secret so it was a given that I read this one (though I found it hard to believe it was a debut, but more on that later). 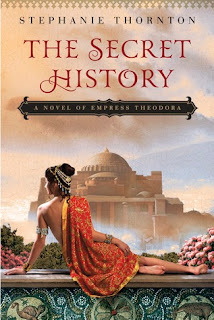 3) Historical Fiction about unknown person (to me anyways) Theodora in 6th century Constantinople. This is a time period that I know next to nothing about, but was anxious to read about. 4) The opening line "My life began the night death visited our house"
And so begins Theodora's story. I loved Theodora, right from the beginning, I think it would be impossible not to love her. She was quite the character who had to grow up really fast in a society that didn't have the luxury of widow benefits or life insurance to provide for one's family after death. Instead the family had to rely on the goodwill of family and friends, sometimes it worked out and other times it didn't (as in Theodora's case). Stephanie Thornton wrote a wonderful story of this young girl who went from being a prostitute to an actress and eventually becoming the empress to Justinian I, an emperor of the Roman Empire. This book is told from Theodora's point of view which made it easy to love her, I was able to sympathize with the young girl trying to provide for her family. To feel the heartaches along the way and even to smile and laugh during her life experiences. I love debuts and think this was an exceptional one, the author brought to life the Byzantine Empire, with words that had me visualizing life during that time period, from the dirty smelly streets to life in luxury I found this book very entertaining and had a hard time putting it down (I finished in a matter of days). Definitely an author that is now a favorite, which I follow through her blog and Facebook. "A shut mouth gathers no foot. Why did I never remember my mother's advice until it was too late?" I read this one a few months back and also really enjoyed it. I also found it hard to believe this one is a debut. I found the writing similar to Kate Quinn's, which is a good thing since I love Quinn's books. I'm looking forward to Stephanie Thornton's next book.